The future is not going to be a happy place. This seems to be the prevailing message in the glut of dystopian narratives that dominate our media. In the realms of literature and television, we’re being bombarded with surveillance states, government oppression, and the restriction of liberties. Even media aimed at a younger audience seem to be capitalizing on the trend – franchises such as The Hunger Games and Divergent don’t have hopeful visions of society. News from the real world doesn’t seem to be much better – climate change, epidemics, economic crises, and war after war. Here in Australia, much like the rest of the world, anti-terrorism laws are slowly working to restrict personal freedoms. It’s hard to remain optimistic about the future when we’re confronted with constant visions of how awful society can be. But there’s a refuge from this dystopian pessimism, one that can be found in most major cities in the developed world: the Apple retail store. A visit to my local Apple Store feels like a glimpse into a happier kind of future. It’s like something from the mind of Hugo Gernsback. The interior is spacious and clean, with neat rows of wooden tables and walls that veritably glow with light. The staff are friendly. The technology is accessible and functional. There’s an optimism – a sense of fun – that is radically different from other types of shops. It’s not just a retail outlet; it’s a playroom. I can sense the vast Apple marketing juggernaut in every aspect of its design. The Apple Store is meant to be a utopian space. With last week’s announcement of the iPhone 6, iPhone 6 Plus, and Apple Watch, the company is back at the forefront of the media. Across the world, queues are already forming outside Apple stores as customers eagerly await the latest gadgets. It’s a credit to the company’s marketing machine that consumers are so excited for every release. They are not just buying a product: they are buying into the brand. They are buying into that idealised, functional futurism that Apple projects. It could easily be argued that the whole company is striving towards a techno-utopian image, but it’s the Apple Stores in particular that embody this branding. The stores are so much more than a retail outlet. The pavement outside the shop is always full of people using the free WiFi, from stressed uni students to opportunistic businessmen. On my most recent visit to the store, the backpackers leaning against the glass windows almost looked like product placements – rugged, world-weary travelers who were depending on the store’s WiFi for a tenuous link back to their homes. The inside of the stores are always crammed with customers. With most of their products available online, the retail outlets must offer something different, something unique. It has become an experience, rather than just a shopping destination. It’s a place where the kids can play with the toys, or where parents can browse products that promise to de-stress their lives. Sales can be made anywhere on the floor, without going to a cumbersome point-of-sale station. If you’re having problems with your device, a Genius can give you assistance. It’s a world of “retailtainment.” And it’s certainly working, with Apple leading the US market with $4,551 sales per square foot of retail space. This kind of techno-utopian design was something that has been lacking from the retail sector until Apple launched their stores in 2001. The aesthetic of the stores is a key part of this image. They are clean and accessible; sterile, without being too utilitarian. The wooden tables are a pleasing contrast to the paneled grey walls. The illuminated posters that line the walls showcase the products in exquisite detail. The sheer volume of products on display means that everyone is able to have a turn. This is one of the great attractions of the Apple retail experience: the products are not in boxes on shelves – they are able to be held in your hands. Tactile experience with a product is far superior to staring at a box. But the aesthetic also extends beyond the inside of the stores. The glass frontages of many of the flagship stores have also drawn attention. 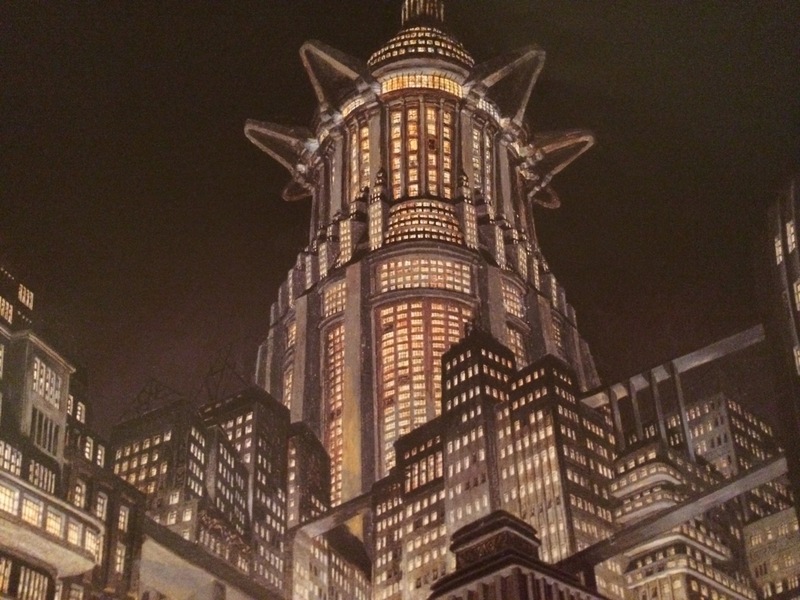 In Yevgeny Zamyatin’s dystopian novel We (1921), the glass buildings represented a lack of privacy – a government that was constantly monitoring the affairs of its citizens. But in this distrustful modern era of mega corporations, the focus on transparency signifies a refreshing change. Apple is a company that is inviting us to look inside. And isn’t it pretty? 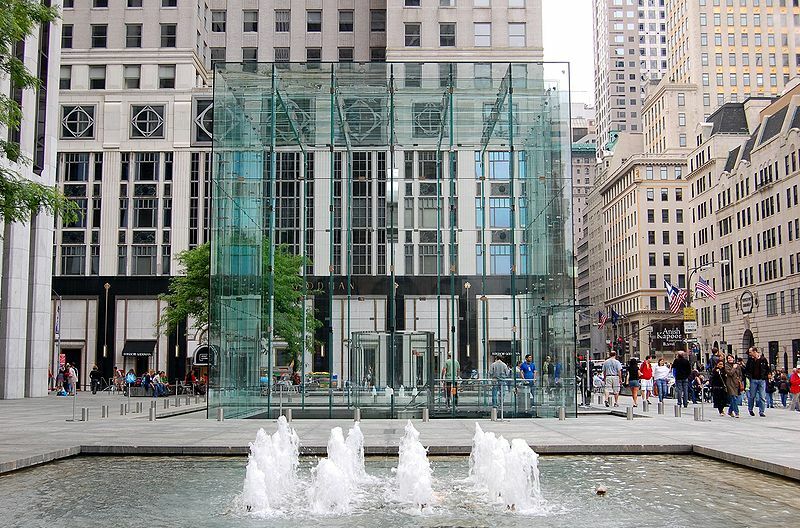 The focus on glass as part the design aesthetic was apparently a result of Steve Jobs’s attention to detail – several patents involving glass features are registered under his name. During the evenings, the stores become beacons of light, attracting customers like moths to a flame. The glass frontage of my local Apple store is currently promoting the iPad Air; the words Enlightened and Empowered are written in bold frosted lettering. Who doesn’t want to feel enlightened and empowered? Technical support is provided in the form of Geniuses, blue-shirted young experts who seemingly have the ability to materialize out of thin air and demonstrate a strong loyalty to Apple. They are persistent – during my most recent visit, I wasn’t left alone for more than thirty seconds. The word genius brings to mind such luminaries as Albert Einstein or Stephen Hawking. Or, indeed, Steve Jobs. 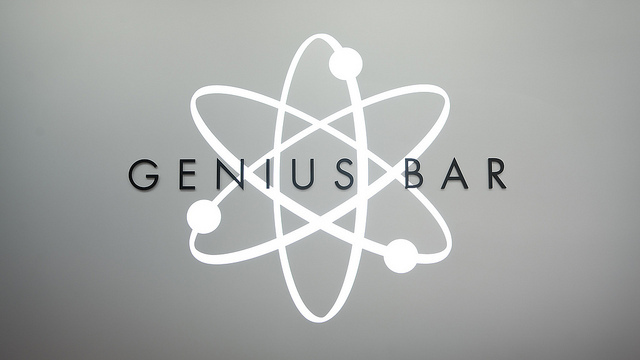 The logo of the Genius Bar – an atom – only emphasizes this connection. Here is a utopia that is built upon foundations of science and technology. And it’s not the first logo used by the company that links back to this theme – the Apple logo itself conjures thoughts of Newton’s apple. Of course, the Apple logo is ubiquitous, a baleful white eye that watches over everything in the store. It is tempting to draw comparisons to the gaze of Orwell’s Big Brother, or Fitzgerald’s Dr. T.J. Eckleburg. And if this were a piece of fiction, those little hints of a potential dystopianism would be a fitting end to this analysis. But the real dystopia is outside the doors of the Apple store, where the rest of the world is facing climate change and recessions, and your iPhone doesn’t function quite as well as the display model. The title of this post was derived from the William Gibson short story “The Gernsback Continuum”, in which the protagonist catches glimpses of an alternate reality that is based on the idealized futurism of Pulp editor Hugo Gernsback. These utopian visions are contrasted with the grittiness of reality. 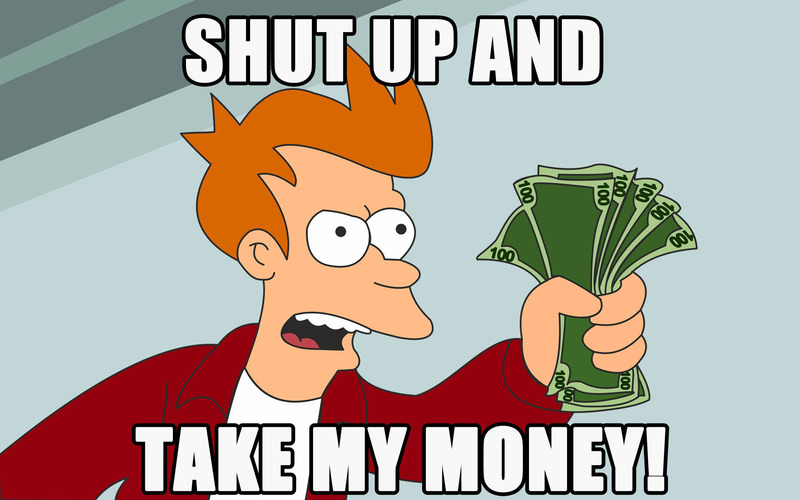 And so it is with the Apple retail store. These spaces are the physical embodiment of Steve Jobs’s vision of a techno-utopian future. It is only when you step back outside onto the pavement does that vision begin to fade along with the free WiFi. I was just talking to someone today about the “apple cult” and how difficult it is to leave. Talking about when I upgrade to a new phone whether I would stick with apple or migrate over to another type of smart phone, my companion remarked “yes, but you own a macbook, don’t you?” and I replied “Yeah I do. I like how all my devices talk to one another”. Invested into the cult as I am, my suggestion at leaving it was quickly negated by my fellow initiate. Reading your piece another thought occurs, most people are introduced to the apple cult in high school. Apple spends millions providing “free” laptops to high school students and more on making sure their products feature prominently in high school libraries and in universities. The cult of apple follows people continuously throughout their educational lives. I am almost surprised that we don’t find a free iPad next to the Gideons’ bible in hotel rooms. But maybe cult is not a strong enough word to describe the apple-isation of society, perhaps religion fits better? Steve Jobs’ life reads like a messianic narrative. A skilled craftsman thrown out by the authority has a dream of heaven and returns to power preaching the word of apple, seeing that it is given unto the many rather than the few before his apotheosis into the God of popular technology. Where you see apple trying to create utopia, I see a cathedral with its promise of transcendence through technology. 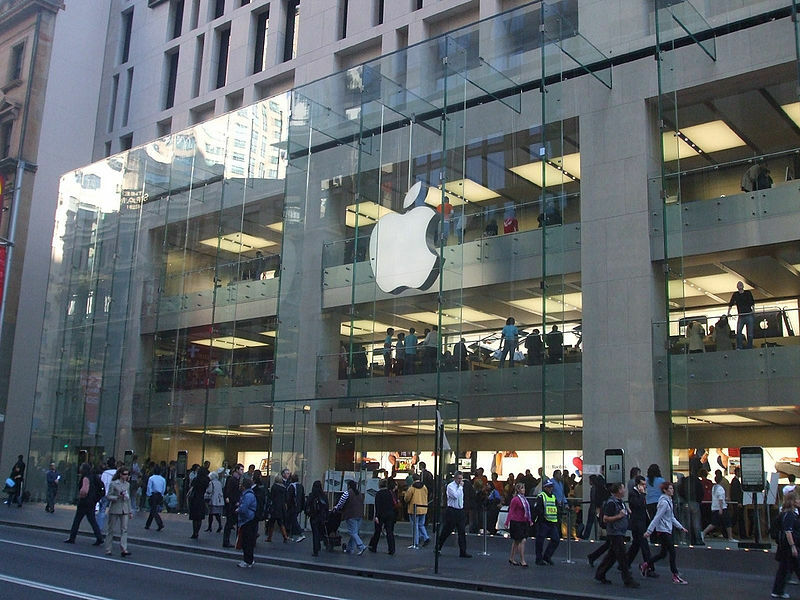 The apple store as you describe it is similar in experience to that of someone from the dark ages entering a church. Here was a place clean and purified from the horrors of the outside world, a place in which the word of peace and the promise of heaven was preached from the pulpit. Priests were initiate into the mysteries of the universe much like our “geniuses” are initiate into the mysteries of the apple OS, who having been amongst us retreat behind the wall into the sanctum sanctorum. The lighting in an apple store acts much like stained glass. Diffusing light everywhere seemingly from no other source but God. Try looking for a source of lighting source the next time you’re in an apple store, I’m pretty sure the effect they are going for is the inner illumination one can only achieve through enlightenment or owning an apple product. The white apple outside every store glowing like a massive neon crucifix in harlem with the words “Jesus saves” blaring for all the world to see. I like your idea of apple trying to embody and sell utopia, but I would say that there is a far more religious engine behind it and say rather that apple are trying to give us a glimpse of heaven. A creation of utopia would never shift product, the promise of nirvana is a much greater selling point. Thanks for finally writing about >The Jobs Continuum | Science-fictionality <Loved it!